A YouTuber claims that a reflection in a visor shows a man not wearing a spacesuit, sending conspiracy theorists into a frenzy. A new piece of evidence has emerged that has conspiracy theorists claiming they’ve found proof that the moon landing was faked, although there’s reason to be skeptical. The photo appears to show a man walking around without a space suit reflected in the visor of an astronaut in the photo. 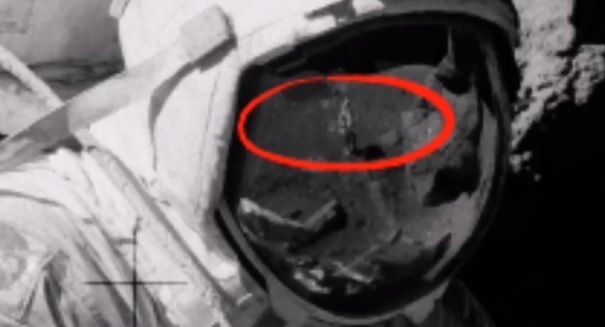 The photo they’re going nuts about not surprisingly isn’t conclusive, and while it could show a person it could just as easily show a rock formation, or it could certainly be a man who is indeed wearing a spacesuit. Moon landing skeptics have claimed that the mission was faked in order for the United States to win the Space Race against Russia, and in reality no one has ever landed on the moon. This particular image is from the sixth and final Apollo 17 mission. The YouTube user who posted the conspiracy video believes that the object in the visor is a man in a waistcoat and not a space suit. He also claims that the figure clearly has long hair that was customary for men in the 1970s.